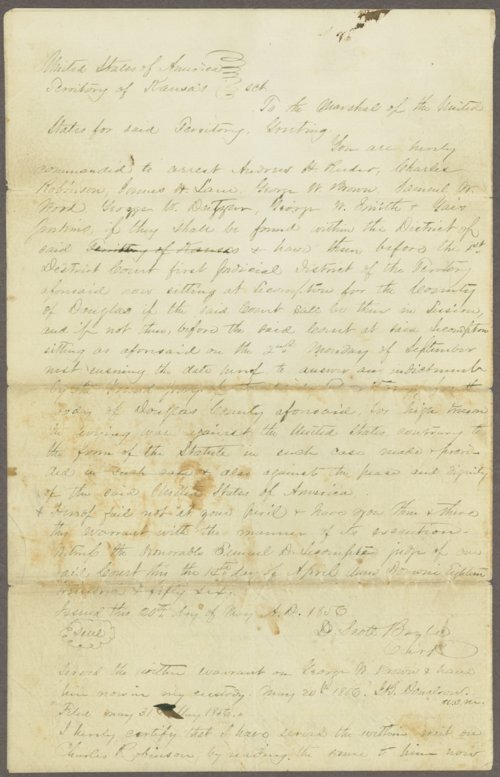 This is the writ of arrest for Andrew Reeder, Charles Robinson, James Lane, George Brown, Samuel Wood, George Deitzler, George Smith, and Gaius Jenkins, who were indicted by a Grand Jury for high treason. There are U.S. Marshal deputies' acknowledgments indicating they had arrested the various individuals. It also includes the Grand Jury's opinion regarding the alleged slander in the newspapers Herald of Freedom and Kansas Free State and the construction of the Free State Hotel in Lawrence apparently in preparation for war. Call Number: U. S. Department of Justice, U. S. Marshall's Office, Writ ordering arrest of Andrew Reader, Charles Robinson, et al.